I love primitive décor and wanted to create a favor bag for the holidays that reflected that love. I also wanted to make something especially for friends! This simple project does both and comes together quickly. Enjoy! 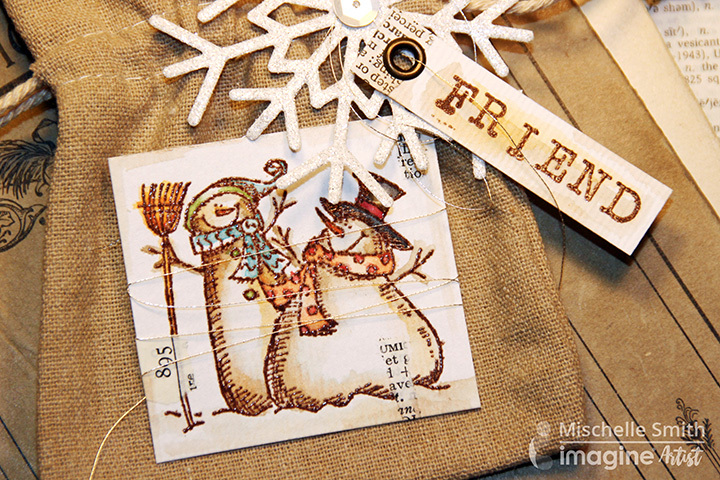 Stamp snowmen and ‘friend’ with VersaFine Sepia ink and emboss with clear emboss powder. Color images with Memento Ink using waterbrush. Adhere torn pieces of dictionary pages as desired. Wrap snowmen with silver thread and attach to bag. Diecut snowflake. Attach silver thread and sequin. Adhere to bag. Add eyelet to saying and attach to snowflake. The challenge at Imagine this month is Winter Window. Of course, visions of snowmen were dancing in my head until I thought of this darling little puppy that is. I went for a non-traditional holiday card and used the speech bubble to create my own window. 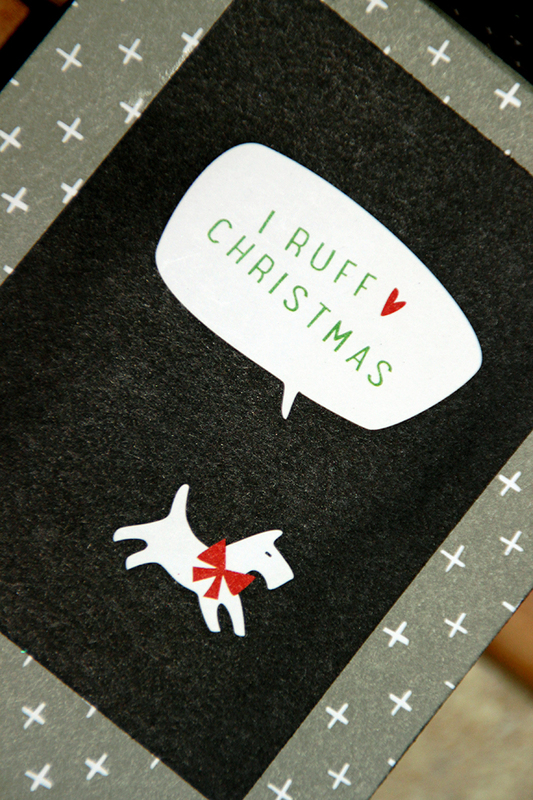 The cutest part of this card is the little puppy inside waiting to be discovered! Sketch a speech bubble on card front and cut out. With VersaMarker outline edge of speech bubble and emboss with black emboss powder. Stamp snowflakes on card with VersaMark ink. Emboss with black powder. Create a bow out of black sheer ribbon. Add silver metallic thread to it and attach to card front. 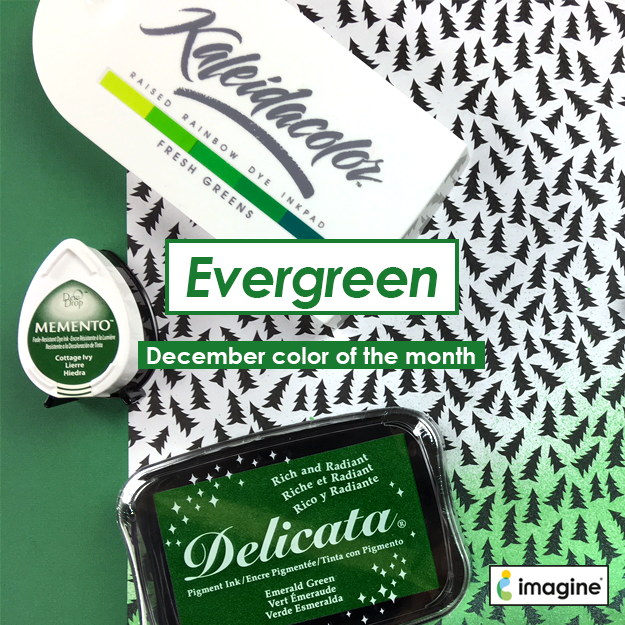 To celebrate the month of December we decided to challenge our Artists with the color Evergreen! We love seeing the fresh greenery in Holiday decor, Christmas tree stamp collections, and a variety of green imagery. 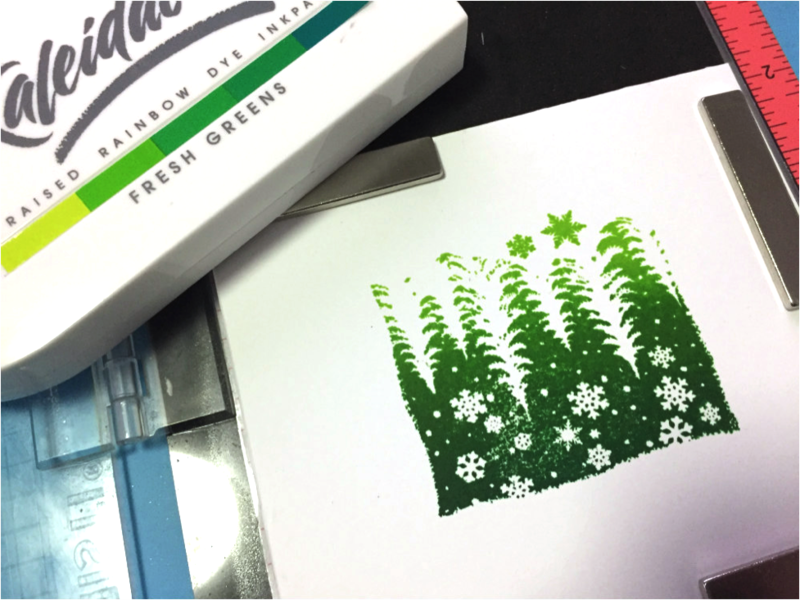 Some of our favorite Tsukineko brands feature fabulous green ink colors to satisfy the Evergreen challenge. Delicata has a new color called Emerald Green, Memento has Cottage Ivy and if you are looking for something outside the norm you can try the Kaleidacolor Fresh Greens 5 color palette. 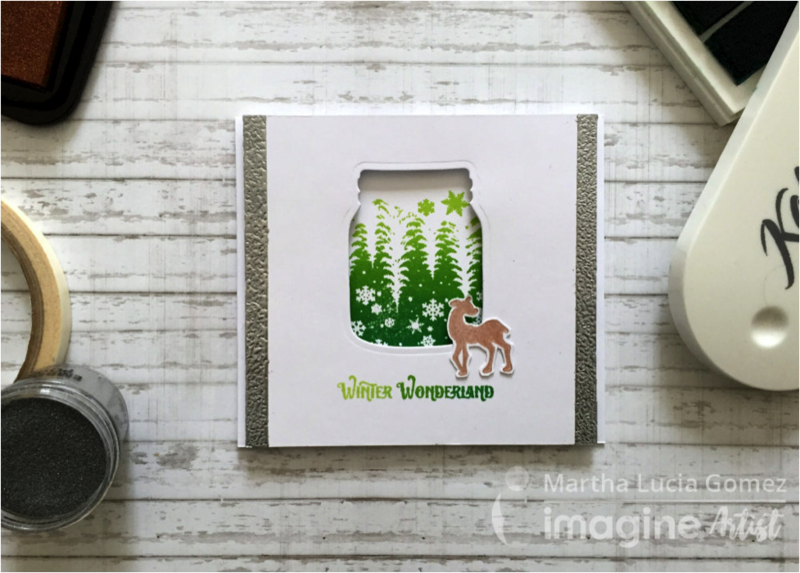 In today’s post, Martha creates a sweet mason jar die cut window in a holiday card, Kyriakos gets crafty with ornaments and Mischelle creates a greenery frame on stationery. Our color challenge this month is Evergreen and I decided to use it in conjuntion with a die cut and one of my favorite versatile inks. Creating winter scenes is so much fun, you can stamp several images or use a complete stamp. On this card, I am using the Bright all Night image from Close to My Heart. 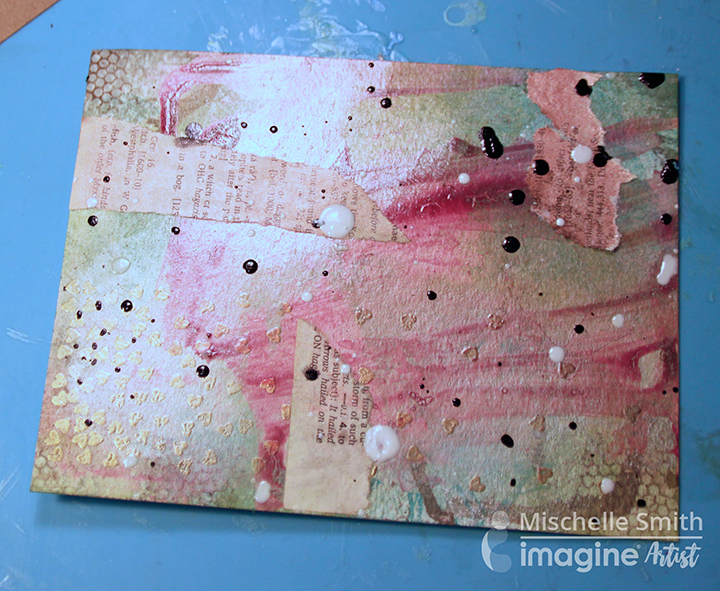 I stamped it over the whisper white card base using Fresh Greens Kaleidacolor Ink. It looks simple and gorgeous with different tones of green. 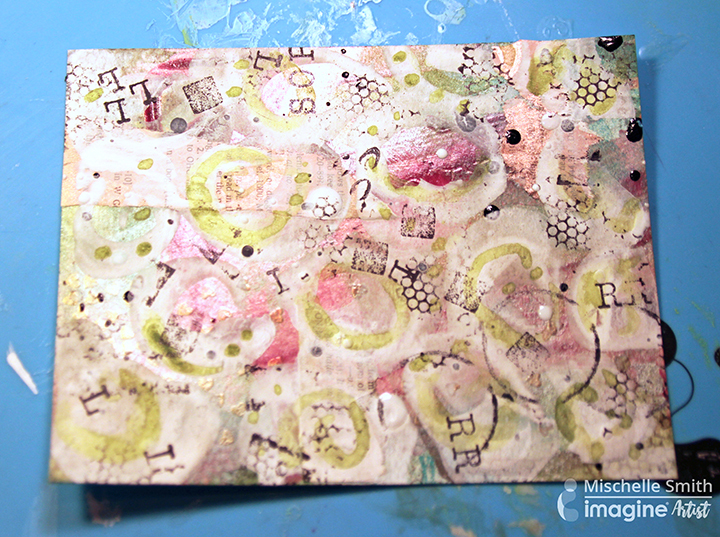 I love the look of the sentiment stamped outside the window in the matching ink! Handmade Christmas ornaments are always special to make and share. They represent your style of home decoration during this festive season and they go far away from the commercial ones. With green color being one of the top choices every year, I chose to make ornaments in tree shape that fit well on Christmas tree, gift boxes, and any other decorations and projects. 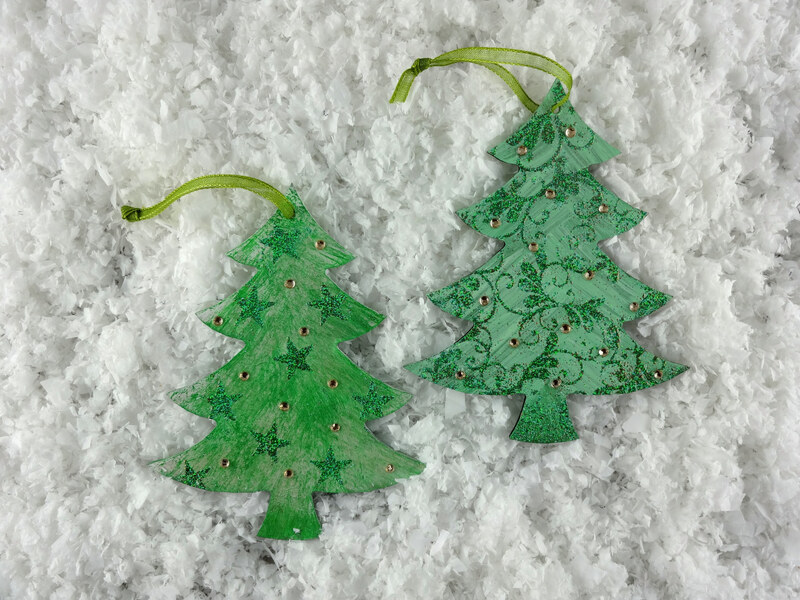 The wooden tree shapes are covered with All-Purpose Ink and Delicata Emerald Green. The designs on top follow the same color choice, but with a little of sparkle, using Imagine’s Verdigris embossing powder. The process shows two ways to color the trees using the inks used in a reverse way. Heavily cover the tree shape with Delicata Emerald Green. Let it dry. Use a soft flat paint brush and make repetitive strokes with the White All-Purpose Ink following the shape of the tree branches. The two inks will start to blend creating soft lines. Repeat on the other side. For the second ornament try the opposite. Paint the tree shape with the All-Purpose Ink, and then make strokes with the Delicata following again the shape of three and the way branches should look. 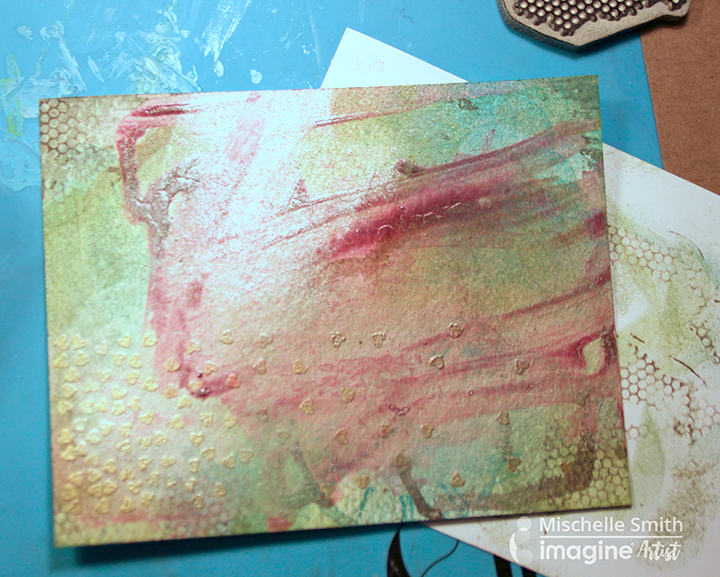 After your ink is dry, emboss with Imagine’s Verdigris embossing powder. Add rhinestones to further embellish the trees. It’s Christmas! It is a time of year that makes me think of stationery. I have always loved stationery and love that I can easily create my own for any season and in any color palette. Imagine’s color of the month is Evergreen and that makes me think of pine trees. I combined some of my favorite greens and blues to create this fabulous stationery ready for this year’s Christmas letter. 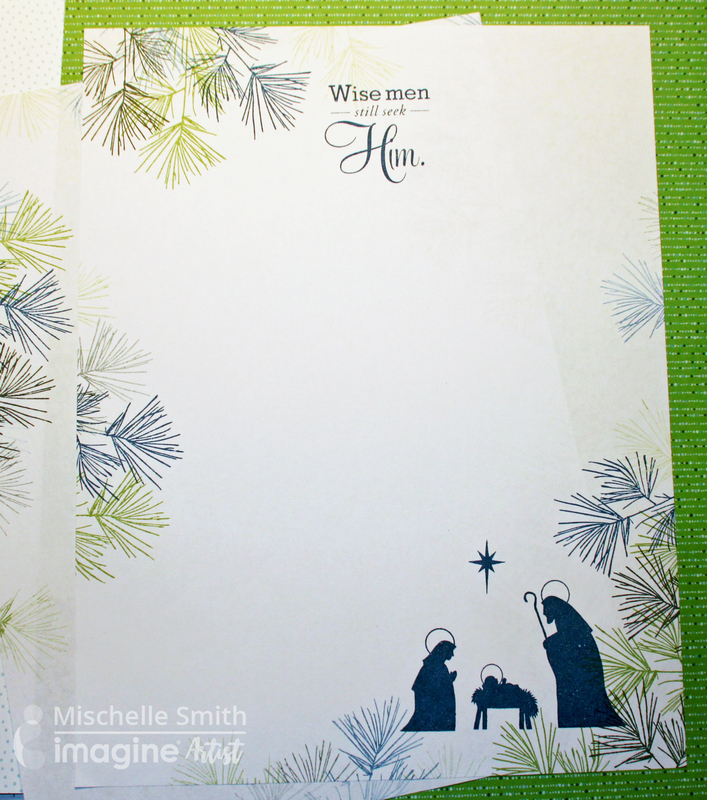 With Nautical Blue ink – stamp nativity, saying “Wise Men still Seek Him” and several pine tree branches. Stamp the remaining pine tree branches with Memento Northern Pine and Bamboo Leaves. 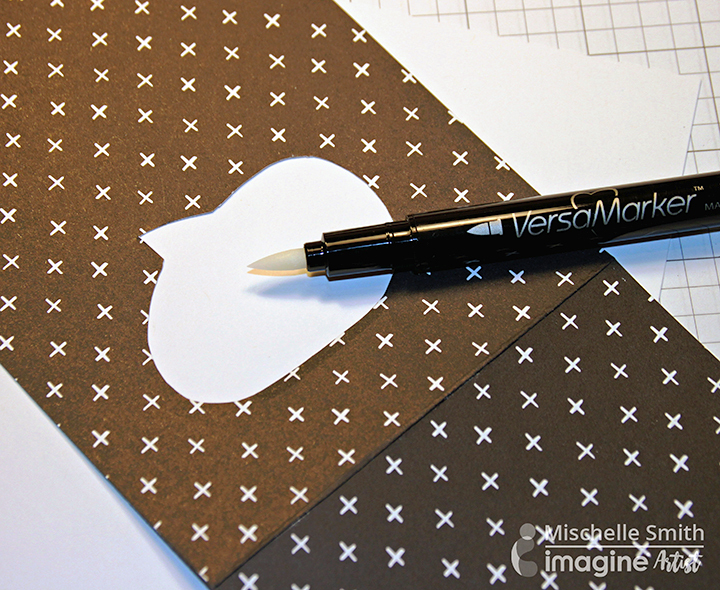 Since dye ink dries so quickly you can start writing on the stationery soon after creating the frame. Enjoy! Today’s blog features a warm and cool dynamic between two creative projects by Elina Stromberg and Mischelle Smith. 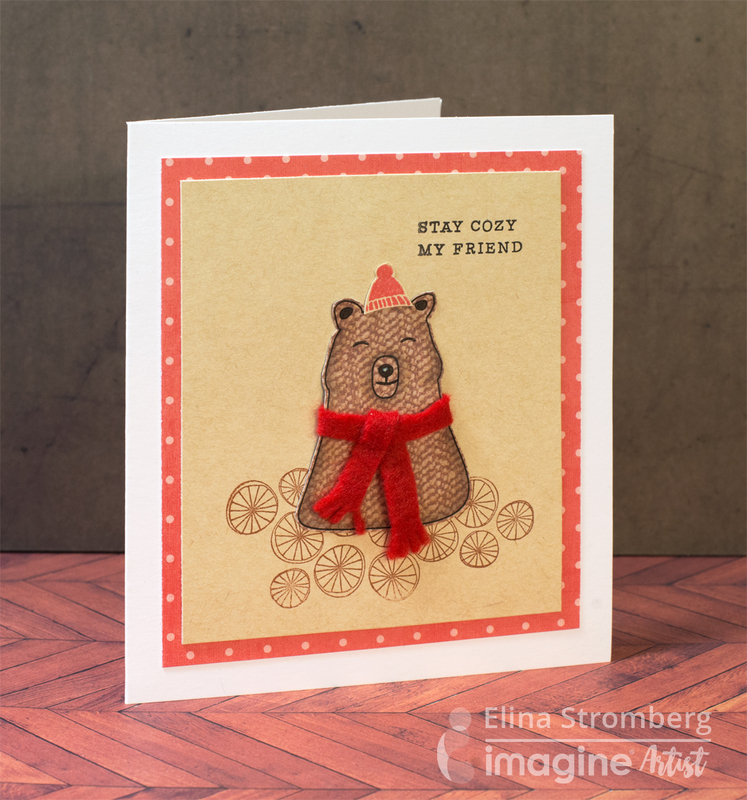 Elina creates this cute bear theme card with a felt scarf to respond to the challenge “heartfelt”. 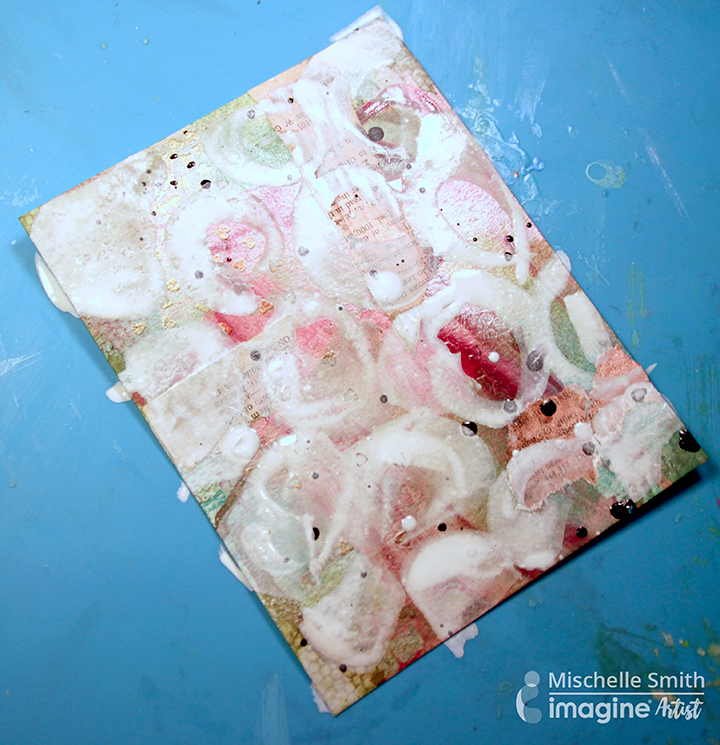 While Mischelle creates a cool wintery snowman crafting project the whole family can enjoy! For this card in a clean-and-simple style, I used a leftover piece of patterned brown paper and a cute bear stamp by Studio Calico. Utilizing patterned papers is a good option when you’re not into coloring or when you want to finish your project quickly. If you want the stamped image to look bit dimensional you can shadow the edges with markers, the same way that you would do on a colored image. This little bear got a felt scarf around his neck; before gluing down the stamped image on the card front I folded the edges of the scarf on the back and secured them with a drop of glue. I mat the card on a piece of dotted paper and glued the card front on the card base. Ready in no time at all! This little fellow is already on its way to my friend! I hope he will make her happy! Our challenge at Imagine this month is ‘crafts for kids’. For this challenge, I wanted to create a project I could use for our family Thanksgiving. Each year the ‘kids of all ages’ participate in a craft suitable for ages 6 – 80 (our youngest to our oldest family members). Some years Grandma likes to give awards… such as …‘most creative’, ‘beautiful coloring’, ‘sparkliest sparkle’…whatever comes to her mind! This snowman is a perfect project for family gatherings! 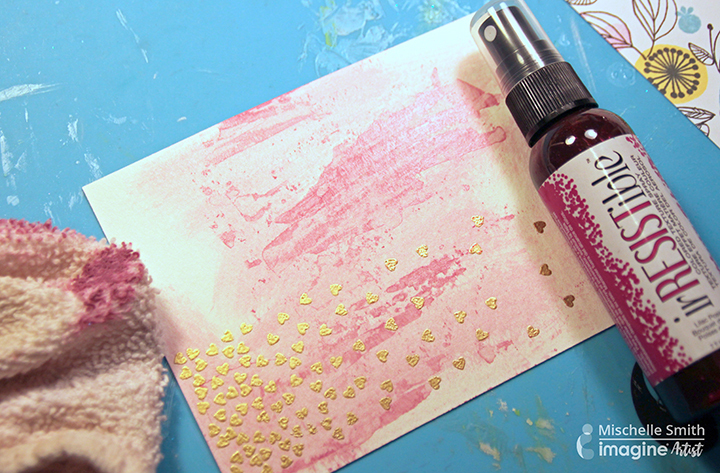 It combines embossing, stencils, stamping, cutting, spritzing, sparkles … everything a kid loves! 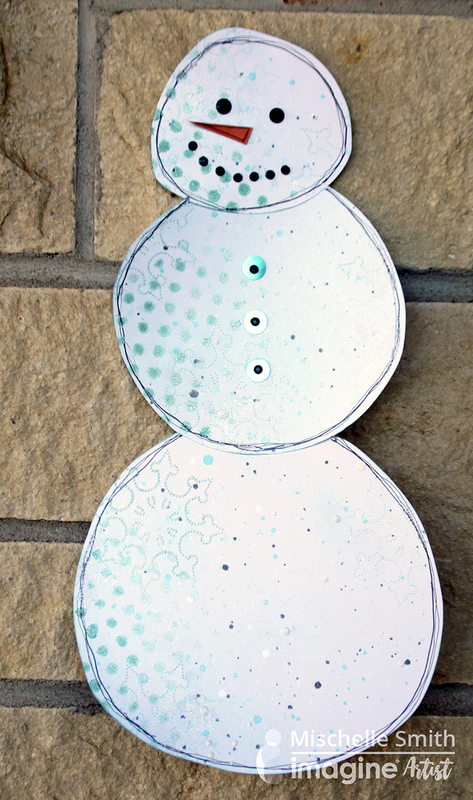 Cut three circles from white cardstock in varying sizes to build the 3 parts of the snowman’s body. 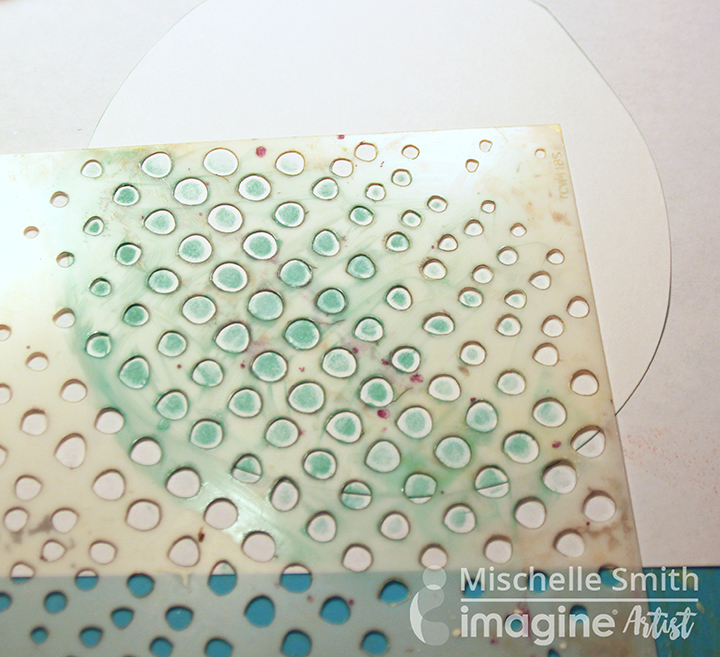 Add circles texture to the edges with VersaColor in Celadon (nice soft blue-green color) and stencil. Stamp snowflakes with Versacolor ink. Emboss with Iridescent Embossing Powder. 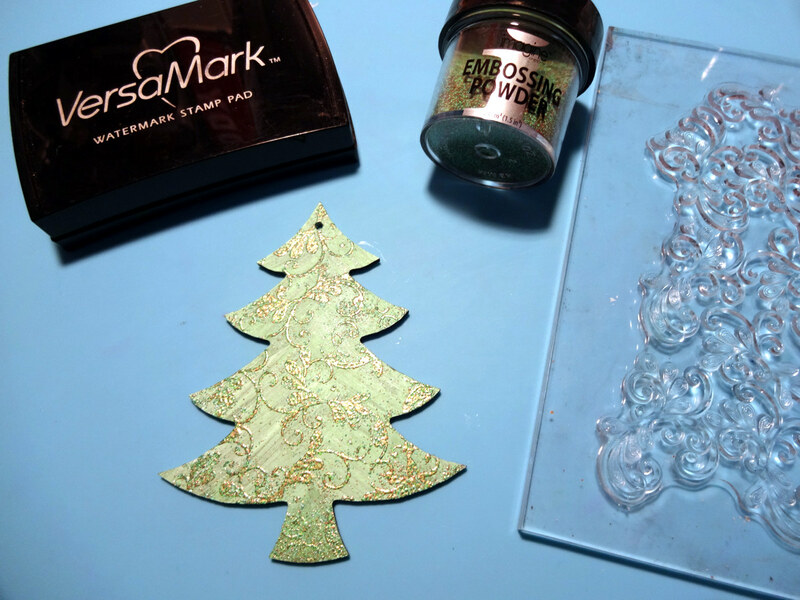 Stamp snowflakes with VersaMark ink and emboss with Iridescent Emboss Powder. Spritz with Sky Blue Fireworks Craft Spray (which has a shimmer). Spatter with Wedding Dress irRESISTible Spray and Tuxedo Black Fireworks Spray and let dry. Spritz with Sheer Shimmer Spritz which is another layer of shimmer. Adhere three pieces together and add black gemstone eyes and mouth. Cut the snowman’s nose out of orange scrap cardstock and attach. Outline with Tuxedo Black Memento Marker as shown. Since this is a family time craft then you can continue crafting your snowman as you please! What a fun challenge this month, a children’s craft project. Vertigo Leaf Sun Catchers are a fun way to spend some quality time with the child in your life. Simply place a leaf under a Vertigo Sheet and trace with a complementary color Fabrico pen. Younger children can make simpler leaf shapes which are easy to cut out with scissors and older children who are more competent with scissors can complete the more complex maple leaf shapes. 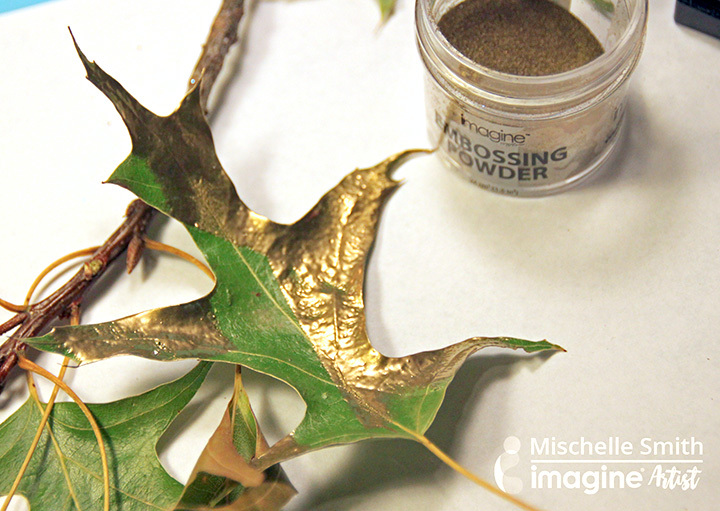 After the leaves are cut out, StazOn inks can be added with ink blushers. I would recommend gloves to keep fingers from becoming too inky! Additional veins can be traces with Fabrico Pens. Apply a few glue dots and adhere to your window for eye catching fall décor! The theme at Imagine this month is ‘Heartfelt’. Heartfelt is the perfect word to sum up the Thanksgiving table that is lovingly prepared every November. No matter which family member hosts Thanksgiving – we all love the opportunity to thoughtfully welcome our guests. Our kid filled families mean that our décor often reflects kid friendly projects created by and with our kids. This is one of those projects. Send the kids out to gather leaves and let the fun begin! Collect enough leaves to work into a decor piece. Apply VersaMark to leaves by using inkpad directly on leaves. Add Embossing powder in Gold. Heat gently with heat tool. As soon as the polymers melt then they will secure to the leaf. Add to any home decor piece such as name tags, garlands or wreaths. I love to use kraft cardstock in my projects. I went through my scrap box and found a white card I had previously gold embossed hearts on. This was the start of a fun mixed media project that used kraft paper for the base. Find a scrap project to play with. Here I had a leftover scrap from embossing, so the hearts were already there. Drizzle Lilac Posies irRESISTible onto the card. Let sit a moment and wipe off with a damp towel. Using direct-to-paper method, add pigment inks in colors of choice to the card front until covered. 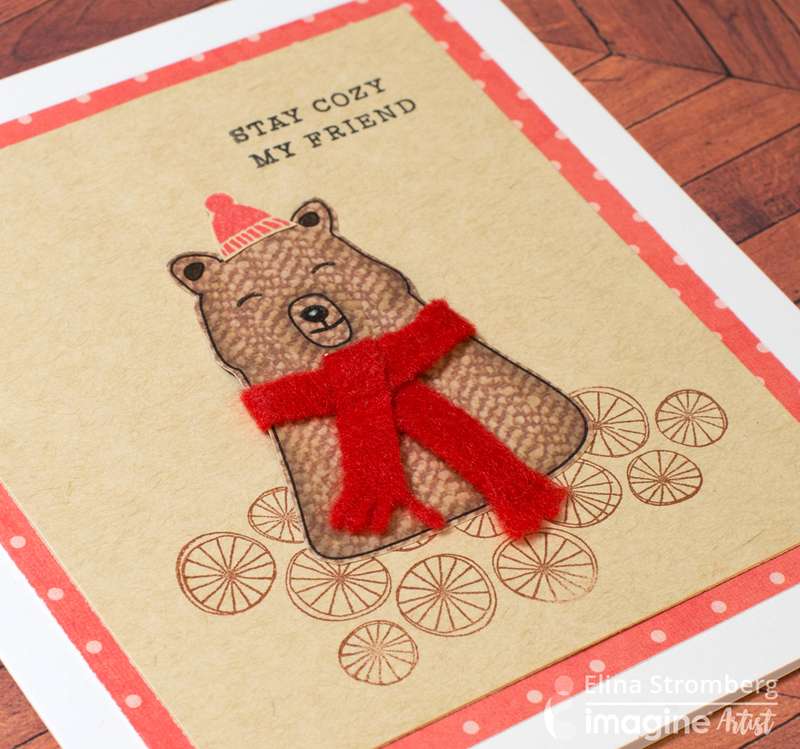 Add texture by stamping a pattern using Memento Rich Cocoa. 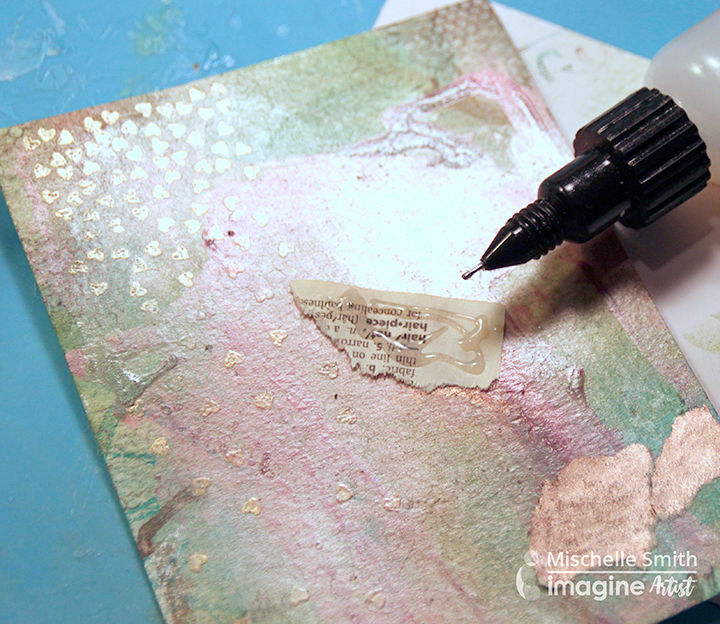 Attach newspaper scraps with On Point Glue. Splatter with irRESISTible Wedding Dress and Tuxedo Black. Let dry. Mix white paint with a small amount of water. Use a paintbrush to add random circles. Let dry. Mix VersaMagic in Tea Leaves with water and uses a paintbrush to add scribbles on top of white circles. With StazOn Jet Black add random stamping. 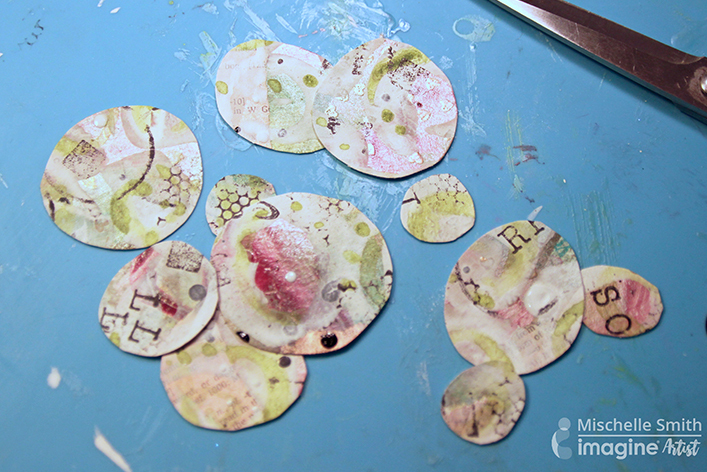 Use scissors to cut circles and leaves from the mixed media piece. Adhere circles and leaves to kraft card front using On Point Glue. Use Tuxedo Black Memento Marker to add doodles. 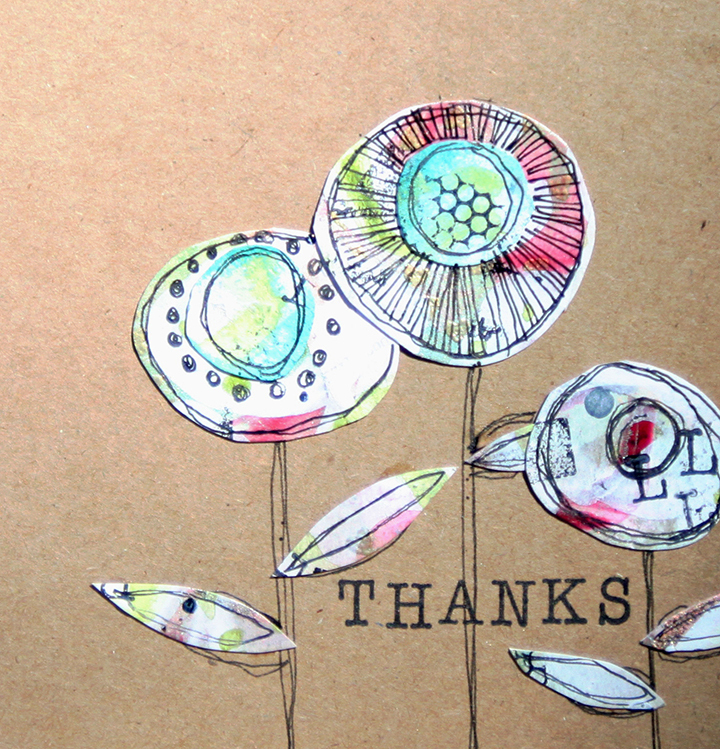 Stamp ‘Thanks’ with StazOn ink. If you enjoyed this quick tutorial then please like or share on Facebook!